NEW Professional 3/4" Drive Metric Socket Set 3/4" Drive Metric 21pce U36 Description Brand New Profesional 3/4" Drive Metric Socket Set - Featueres 21 Pieces High quality professional 3/4" Socket set which features: ~ Sliding T-bar, 2 x extension bars: 100 and 200mm with a 495mm quick-release ratchet handle. 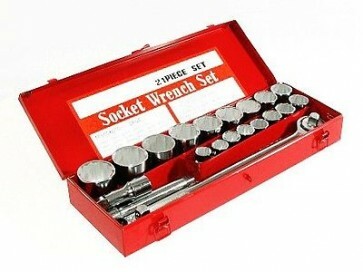 Sockets: 19, 22, 24, 26, 27, 28, 30, 32, 34, 36, 38, 41, 42, 45, 46, 48 and 50mm. Securely boxed in a Cary Case. Shipping All orders placed before 3 PM are sent out the same day via Royal Mail / Courier Collection from our UK Based warehouse, We ensure items are packed with great care and arrive in a timely manner. Returns In the unfortunate event that the item received was defective or incorrect, Please contact us immediately so we can take prompt action in resolving the matter with you through the following methods: A replacement can be sent out urgently through careful staff quality control Alternatively a full refund can be made upon return of the item We Guarantee a 90 day return policy so please be assured that your transaction is fully protected within this timeframe.